Tad Calcara has been principal clarinet of the Utah Symphony since 1999. He began studying piano at age five and clarinet at 12. 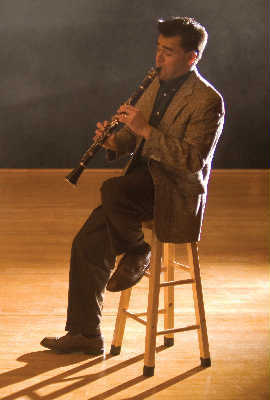 Mr. Calcara studied clarinet at the Manhattan School of Music, San Francisco Conservatory of Music, and the Cleveland Institute of Music. In addition he attended summer music festivals at Tanglewood, Aspen, and Music Academy of the West. Prior to his appointment with the Utah Symphony he performed with the New World Symphony, Cleveland Orchestra, and the Grand Tetons Music Festival Orchestra. On several occasions Mr. Calcara has performed as soloist. He performed the Copland Clarinet Concerto with the New World Symphony, Utah Symphony, the Texas Festival Orchestra at Round Top (broadcast on NPR), and the Cleveland Orchestra. He has appeared several times with the Utah Symphony in performances of clarinet works with orchestra by Mozart, Artie Shaw, and Lutoslawski. In recital he has performed for Radio France in Montpellier, and in the spring of 1999, the first ever New World Symphony Honors Concert. When not performing with the Utah Symphony he can be heard playing chamber music in and around Salt Lake City, or leading his 16-piece New Deal Swing Big Band, which specializes in classic Jazz & Swing Music from the 1930s and 40s. His performances with New Deal Swing have included concerts with the Utah Symphony, Salt Lake Jazz Festival, and centennial tributes to Benny Goodman and Artie Shaw. He has also performed with Big Band legends Franz Jackson (former member of the Fletcher Henderson and Fats Waller bands) and the sole surviving member of the Duke Ellington Orchestra, vocalist Herb Jeffries. Mr. Calcara’s vintage 1930s wardrobe provided by Zoot Suit Store.com. Tad wearing jacket once belonging to Artie Shaw.